The Knitting Pirate » In Which the Pirate Begins Blog Week. In Which the Pirate Begins Blog Week. Day One: A Day In The Life. First-person or third-person account? Will you write from the point of view of the garment/finished object, or as a wearer or observer? Finished project or WIP? Will this be an account of the creative process and what the object goes through, or it’s ‘life’ after creation? Fact or fiction? Will your account describe the wear and tear, love and compliments all experienced by a crocheted hat on a rainy day, or will you write the fantastical account of what a knitted trilobite gets up to on its adventures once the door is shut and nobody is looking? I am languishing. LANGUISHING. Ignored, unloved. Might as well unknit myself when no one's looking. It's not as if anyone cares, really. I had such high hopes, when I was first cast on. My older sister laughs at me; she's finished and waiting for me to join her. Slowpoke, she says. Half-sock. And my person... I haven't seen her in weeks. Maybe it's months; I lose track of the time in here. In the dark. No one really visits me, so it's hard to keep the days straight. Every so often she comes in to see me, and I get a little bit bigger. But, alas, she grumbles and mumbles and complains about my yarn, and then she goes away again. I don't even have a heel yet! This entry was posted on Monday, May 12th, 2014 at 07:45 and is filed under Blog Week. You can follow any responses to this entry through the RSS 2.0 feed. Both comments and pings are currently closed. 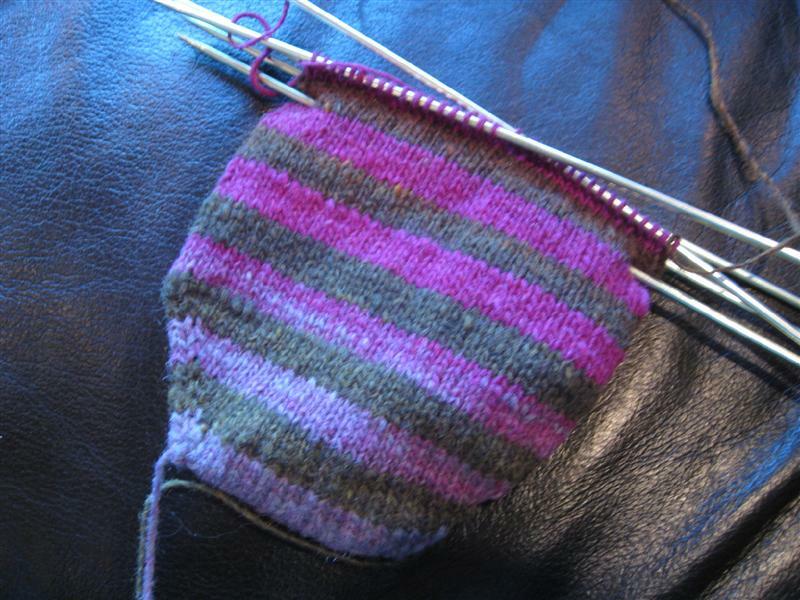 You'll be finished pretty soon, half-sock: comments here come to motive your person ! Do your best, my Pirate ! Your poor sock! Far too lovely for your person to let you languish much longer. I have a sock on the way who feel exactly like you !